MOSCOW, April 18. /TASS/. Neither citizens of Khan Shaykhun, in Syria’s Idlib Governorate, nor experts of the White Helmets group have complained about poisoning over the past two weeks since reports about the alleged chemical attacks, official spokesman for Russia’s Defense Ministry said on Tuesday. "The city lives its own life. There haven’t been any requests for assistance by special medications, antidotes and deactivation for citizens and also pseudo-rescuers," Igor Konashenkov said. "The only ‘evidence’ of using chemical weapons is these two videos of the White Helmets," the general said. Konashenkov noted that neither participant of the rescue operation nor the alleged victim appeared on the American or European TV channels later. So far, no contamination zone was defined from where local citizens should have been evacuated, he said. "At the same time, every day the number of unbiased experts grows, especially in Western countries, who ask these evident questions. 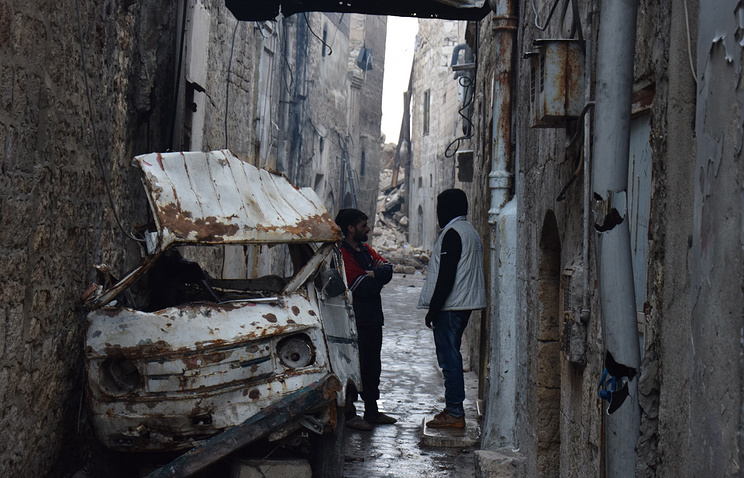 These specialists, who have the knowledge and experience, cannot explain how these representatives of the White Helmets could work in the contamination zone for so long remaining alive without any gas masks and special uniform," Konashenkov noted. "These doubts of professionals reduce to zero numerous accusations of Western politicians and diplomats, who immediately found the one to blame without simply checking the data of social networks and carrying out an impartial investigation," he said. It is clear that those behind these accusations are not planning to conduct a thorough investigation into the incident, and this reminds of the situation in Iraq and Libya, Konashenkov said. The incident in Syria’s Khan Shaykhun, where chemical weapons were allegedly used, occurred on April 4. Russia’s Defense Ministry said on that day the Syrian aircraft hit the workshops where terrorists were producing munitions with chemical agents. Washington accused Damascus of using chemical weapons. Following an order of US President Donald Trump, the US military fired 59 Tomahawk cruise missiles from its warships in the Mediterranean on an air base in the Syrian Homs Governorate in early hours of April 7. The missile strike targeted what Washington claims was a starting location for the chemical attack.